It took 121 hands of heads-up play, but we finally have a winner in Event #10: $1,500 Limit Hold'em, Brent Wheeler. Wheeler bested Mark Mierkalns to earn $191,605 and his first career gold bracelet. 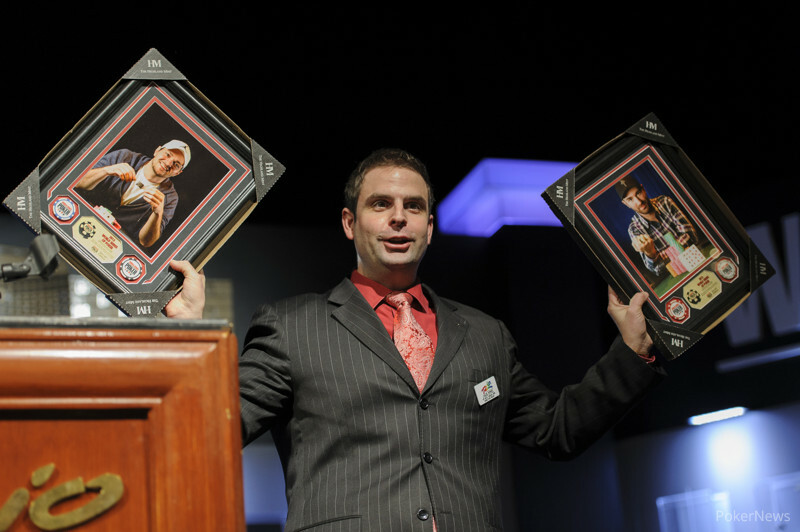 The Chicagoan now has over three quarters of a million dollars in career tournament earnings and 14 World Series of Poker cashes. The third and final day began with 19 players, and leading the way was the only bracelet winner remaining; Eric Froehlich. Jeff Shulman, who entered the day with just a few big bets, was the first to bust, and from there we lost Brandon Guss, Thomas Blizniak, Melanie Banfield , and Binh Ly. Ly was one of the leaders on the money bubble, but fell down the counts during the latter stages of the evening. On Day 3 he busted to Grayson Scoggin, who turned a pair of kings against Ly's ace-high. The river was a blank, and Ly was eliminated. Following Ly out the door were Morgan Newman, John Zipperer, Jack Jiang, and Aaron Ogus. The unofficial final table lasted for longer than an hour, until finally Ahmed Mohamed busted in 10th place. Mohamed got into a flip with ace-king against Malissia Zapata's pocket queens, and the queens held up. 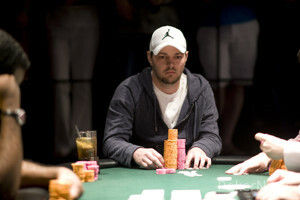 The first player to bust at the official final table was Froehlich. After taking a few hits, including one hand where Chiduziem Obi ran down a wheel, Froehlich was in for less than a big blind. Unfortunately, he was unable to survive against two opponents, busting in ninth place. Alex Queen, Brian Nichols, and William James were the next three players to hit the rail. Queen and Nichols were very short stacked when they exited, while James lost a series of pots at the start of Level 24. Finally, James was all in against two opponents, and lost to Mierkalns who rivered a pair of tens. Grayson Scoggin, who was playing in his first WSOP event, finished in fifth, Obi busted in fourth, and Zapata took her leave in third place. Wheeler, who entered the final table seventh in chips, started heads-up play with a small lead, and began to run away with it. Then suddenly, in Level 27, the pendulum swung. Mierkalns built a more than 2:1 chip lead, but Wheeler came storming back. In the end, Wheeler finished the deed in Level 28, and you can read that hand below. 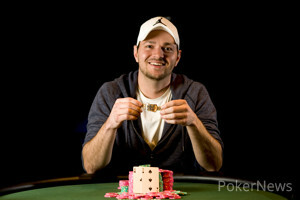 Congratulations to Wheeler for shipping the 10th bracelet awarded this summer. There are still 52 more up for grabs, so be sure to check back to PokerNews for all of your exclusive live tournament updates from the 44th annual WSOP! Hand #240: Brent Wheeler received a walk. Hand #241: Wheeler raised on the button, Mark Mierkalns three-bet, and Wheeler called. The flop came , Mierkalns led out, Wheeler made it two bets, Mierkalns made it three, Wheeler made it four, and Mierkalns moved all in. Wheeler called. Wheeler was drawing to a ten to double or running pair cards higher than a three to chop the pot, but it wasn't to be as the turn and river came , respectively. 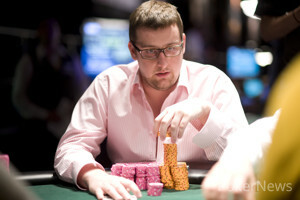 Mierkalns was eliminated in second place, earning $118,300. Hand #231: Mark Mierkalns got a walk. Hand #232: Mierkalns raised, Brent Wheeler called. The flop came . Wheeler check-called. The turn was . Wheeler check-called. The river was . Wheeler bet, Mierkalns called. Wheeler showed . Hands #233-236: The players received walks. Hand #237: Wheeler raised, Mierkalns called. The flop came . Both players checked. The turn came . Both players checked. The river came . Mierkalns bet, Wheeler folded. Hand #238: Mierkalns called, Wheeler checked. The flop came . Wheeler check-folded. Hand #239: Wheeler raised, Mierkalns folded. Hand #226: Mark Mierkalns raised, Brent Wheeler called, and the flop came . Wheeler check-called a bet, then check-called another when the turned. Both players checked when the completed the board, and Mierkalns won with . Wheeler showed . Hand #227: Mierkalns called a raise, then check-called a bet on the flop. The turn was the , Mierkalns checked again, and Wheeler bet. Mierkalns check-raised, Wheeler called, and the completed the board. Both players checked, and Mierkalns announced that he had jack-high. Wheeler showed for ace-high and won the hand. Hand #228: Mierkalns raised and won the pot. Hand #229: Mierkalns received a walk. Hand #230: Wheeler three-bet, then led out on a flop of . Mierkalns raised, Wheeler called, and the turn was the . Wheeler led again, this time Mierkalns called, and the completed the board. Wheeler bet, Mierkalns called, and Wheeler showed for a pair of aces. It was good. Hand #220: On the 100th hand of heads-up play, Mark Mierkalns raised, and Brent Wheeler folded. Hand #221: Wheeler raised, Mierkalns called. The flop came . Mierkalns check-called. The turn came . Mierkalns check-folded. Hand #222: Mierkalns raised, Wheeler called. The flop came . Wheeler check-raised. Mierkalns called. The turn came . Wheeler check-called. Both players checked the . Wheeler showed . Hand #223: Mierkalns got a walk. Hand #224: Mierkalns raised, Wheeler folded. Hand #225: Wheeler raised, Mierkalns reraised, Wheeler called. The flop came . Mierkalns bet, Wheeler called. The turn came . Mierkalns bet, Wheeler raised and Mierkalns called. The river came , and Mierkalns check-called. He showed . Hand #214: There was unknown action. Hand #215: Brent Wheeler raised, Mark Mierkalns three-bet, and Wheeler called. Mierkalns led out on the flop, Wheeler called, and Mierkalns check-folded on the turn. Hand #216: Wheeler called a raise then check-folded on an flop. Hand #217: Mierkalns received a walk. Hand #218: Mierkalns raised and won the pot. Hand #219: Mierkalns called a raise, then check-called a bet on a flop of . Both players checked when the turned, and the completed the board. Mierkalns bet, Wheeler raised, Mierkalns made it three bets, and Wheeler called. When Wheeler called, Mierkalns mucked, prompting Wheeler to open up . Hand #209: Mark Mierkalns got a walk. Hand #210: Mierkalns raised, Brent Wheeler called. The flop came . Wheeler check-folded. Hand #211: Mierkalns got a walk. Hand #212: Mierkalns raised, Wheeler raised and Mierkalns called. The flop came . Wheeler bet, Mierkalns called. The turn came . Wheeler check-called. The river came . Wheeler check-called. Mierkalns showed . Hand #213: Mierkalns got another walk. Hand #206: Mark Mierkalns raised on the button, Brent Wheeler three-bet, and Mierkalns called. Wheeler led out on the flop, Mierkalns called, and the turn was the . Wheeler bet again, Mierkalns raised, and Wheeler folded. Hand #207: Mierkalns called a raise, then check-called a bet on the flop ( ) and the turn ( ). The river was the , Mierkalns opted to lead out, and Wheeler tank-called, showing . It was good. Hand #208: Wheeler three-bet, then led out on a flop of . Mierkalns called. The turn was the , Wheeler led out again, and Mierkalns raised. Wheeler called. The river was the , Wheeler check-called a bet, and Mierkalns mucked when Wheeler showed for eights and fives.